Basking in the hot sun, drifting in and out of dreamy snoozes while relaxing on the white sand beach, cooling in the Pacific waters as the kids build their fairytale sandcastle—this is the antithesis of the daily grind. This is Huntington Beach, California, also known as Surf City U.S.A., where the warm sun arrives as early as April and hangs around well into October. This classic southern California beach town offers plenty of on- and off-sand family activities, a fine array of beach-close accommodations, a host of delicious restaurants of varied cuisines, classic vintage-style cafes, and even a long stretch of beach inviting dogs to live it up! But that’s all just the tip of the seashell. HB is an ideal family vacation hotspot that won’t break the bank. This is a city steeped in history. The annual Huntington Beach Independence Day Parade has been a tradition for what will be 104 years this July 4th, and is believed to be the largest of its kind in the Western States. Parade festivities run from 10:00 a.m. to 12:30 p.m. and draw large crowds, so arrive early. The day is capped off with a mesmerizing fireworks show over the pier at 9:00 p.m. Bring chairs, blankets and sunscreen to take in the daytime and evening events. In addition to frolicking in the surf and lazing on the sand, HB offers beach volleyball courts, fire rings for BBQs on the sand, pier fishing, and boating and kayaking in Huntington Harbor. If you’re looking for more physical activity, you can bike, jog or rollerblade along the beachside path that stretches for nearly 15 miles into neighboring Newport Beach. 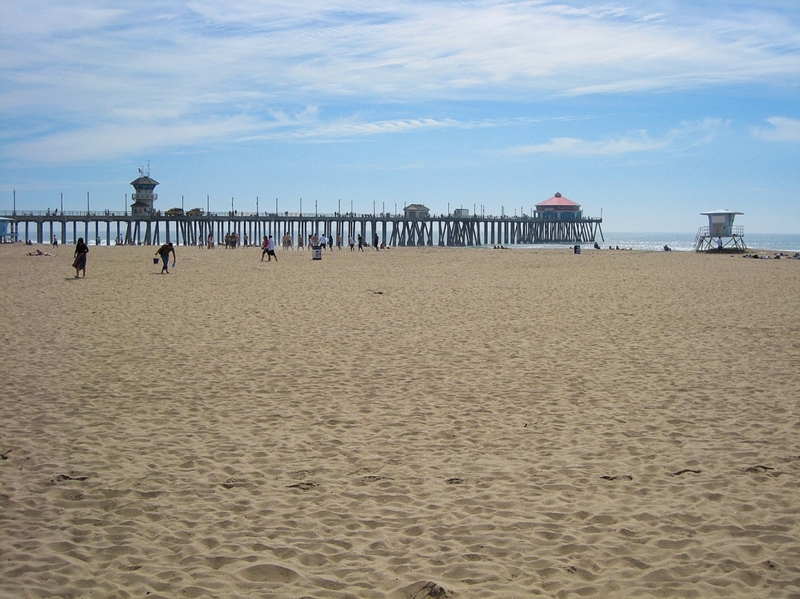 Huntington Beach earned its Surf City U.S.A. title from holding annual professional surfing competitions going back to 1959. That tradition continues today, as the city hosts the U.S. Open of Surfing every July when the greatest surfers in the world converge on HB, along with thousands of beachgoers and fans, to compete and take in the classic summer scene. This free event is scheduled for July 18-27 at the pier. Downtown HB is where most of the fun happens. 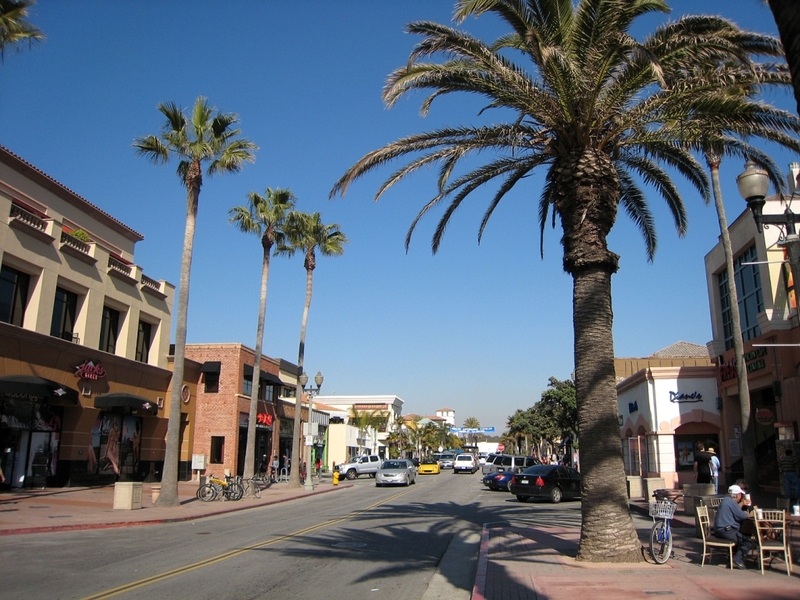 Main Street begins at Pacific Coast Highway (PCH) and the pier, and is lined with boutiques and surf shops, restaurants and cafes, bars and pubs. There, you’ll find several restaurants with fine dining and water views. The sidewalk cafes serve terrific breakfasts. The downtown/pier area scene is alive and electric from noon to late night, quiet and relaxing in the morning. Sleeps near the water in Huntington Beach range from moderate to luxury. Both 4-diamond-rated Hyatt Regency Huntington Beach Resort and Spa and Hilton Waterfront Beach Resort provide plush comforts with stunning ocean-view rooms. You’ll find more modest-priced snoozes at the Best Western Huntington Beach Inn, the Huntington Surf Inn, and the Sun ’n Sands Motel. All aforementioned establishments are located on PCH, but across the street from the sand. (Huntington Beach offers no beachfront accommodations.) However, if you have an RV, you can park it by the sand at Bolsa Chica State Beach RV Camping or Sunset Vista RV Campground. Accommodations and RV spots book up months in advance, so plan accordingly. Access to Huntington Beach is easy. The San Diego (I-405) Freeway runs through HB, and Orange County John Wayne Airport and Long Beach Airport are each just a 15-minute drive away. Exit at Beach Boulevard or Goldenwest Street and go south to the ocean and the historic downtown/pier area. Let Your Kids Play With History in Washington, D.C.